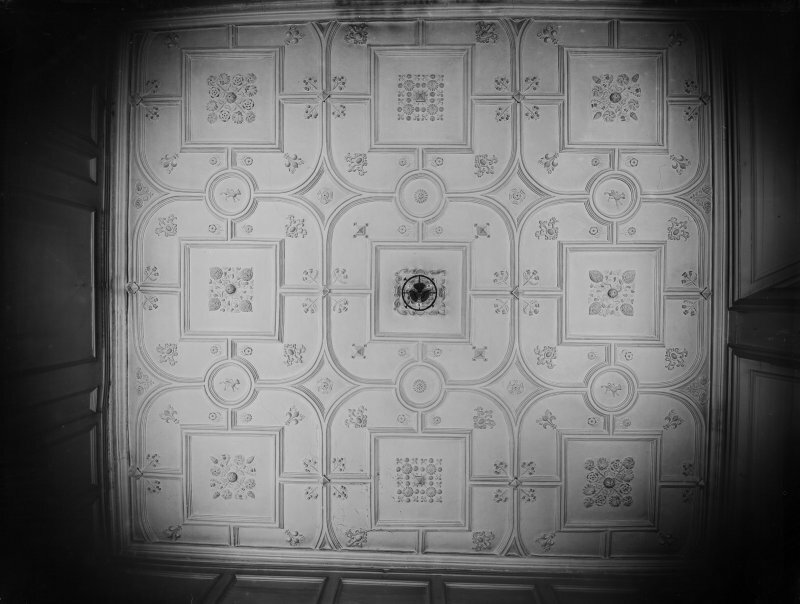 Riddle's Court, Lawnmarket, Edinburgh, Baillie MacMorran's House -Details of Ceiling in Square Room Signed "Mens. et Delt. 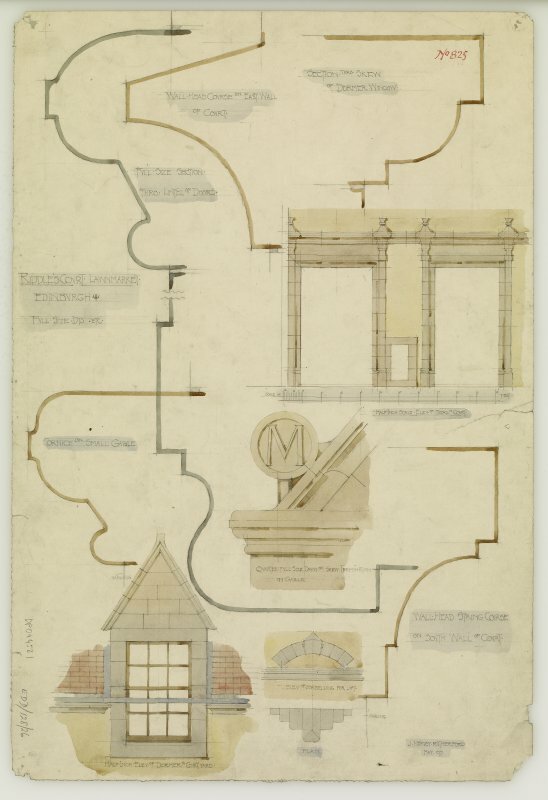 1896 Ramsay Traquair"
Entrance door and dormer window; various details Delt. 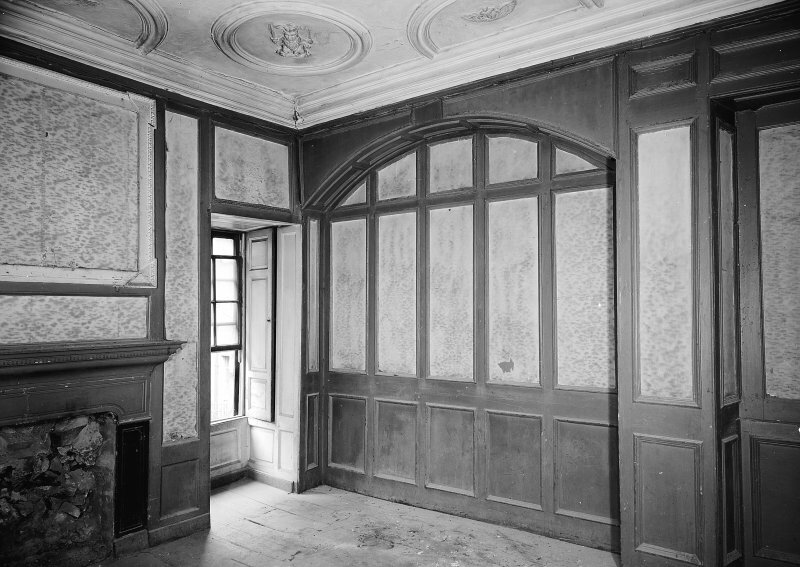 "J Harvey Rutherford 1897"
Interior, general view of panelling in Second Floor West room of North Block. 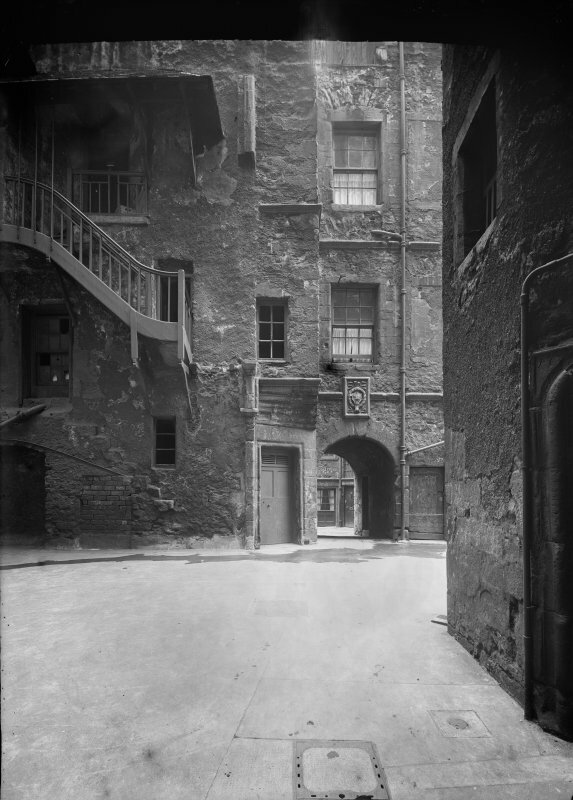 General view of Riddle's Court. 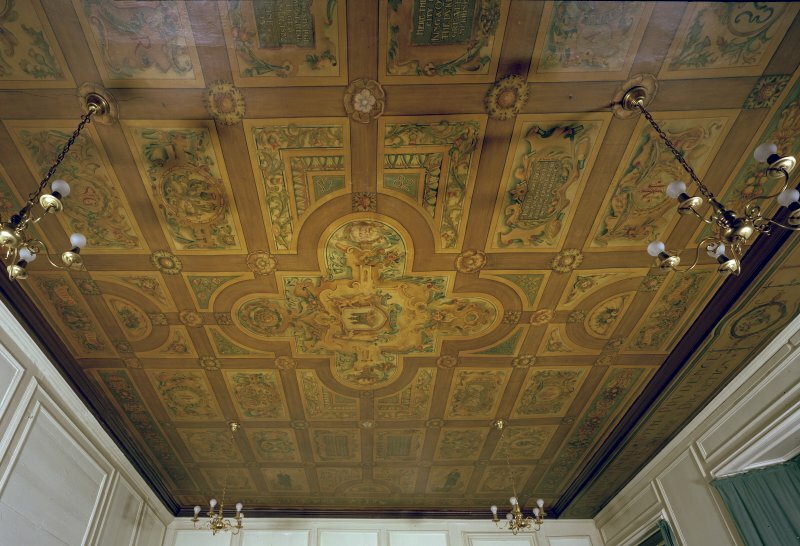 Interior-view of painted ceiling from West. 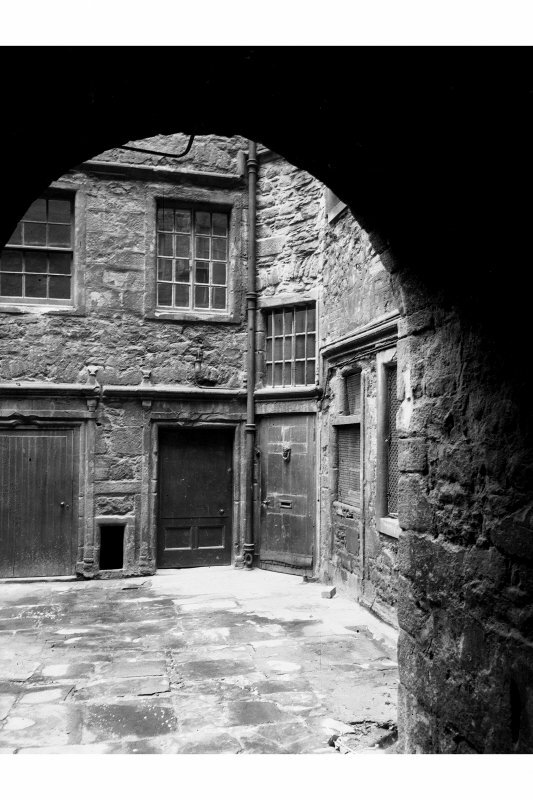 View of entrance to Riddel's Close, Edinburgh. 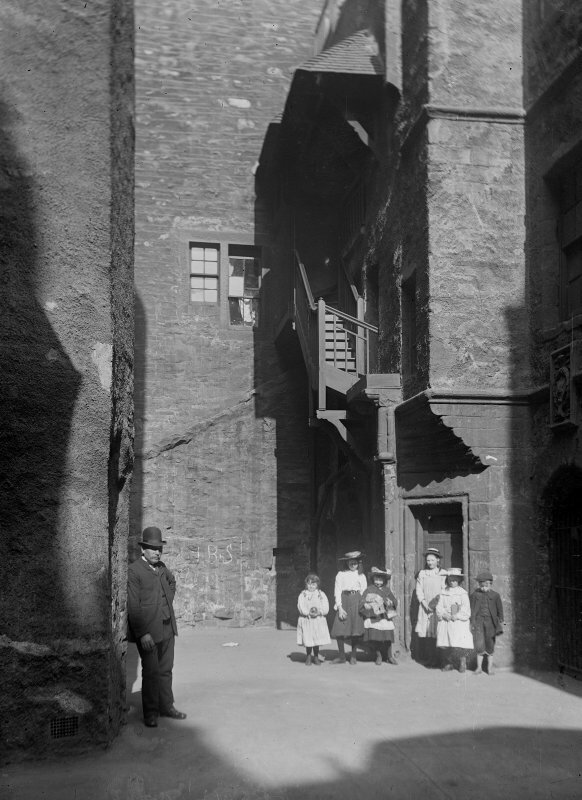 Titled: "Riddells' Close, High Street. 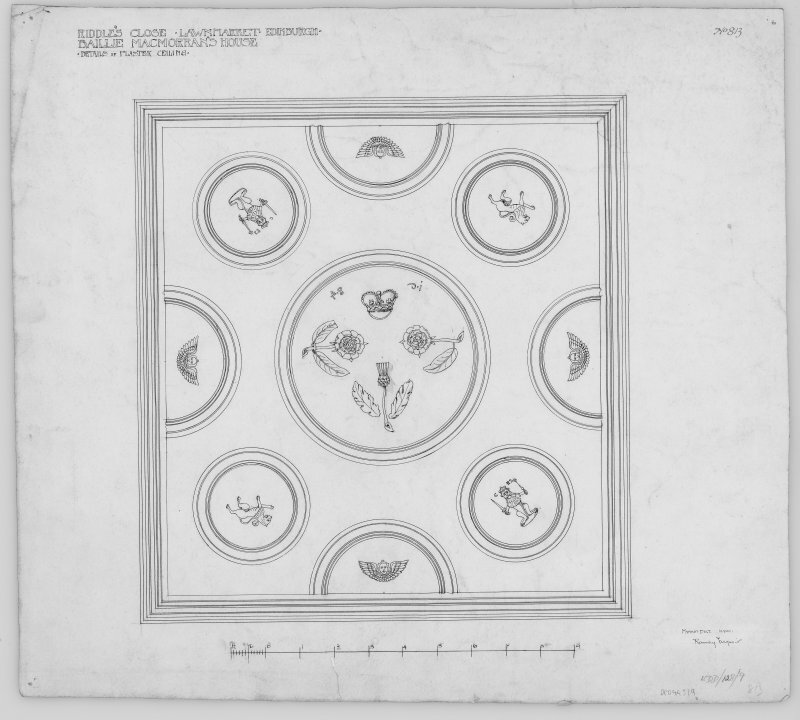 August 1903"
Plaster ceiling in square room Mens. et delt. 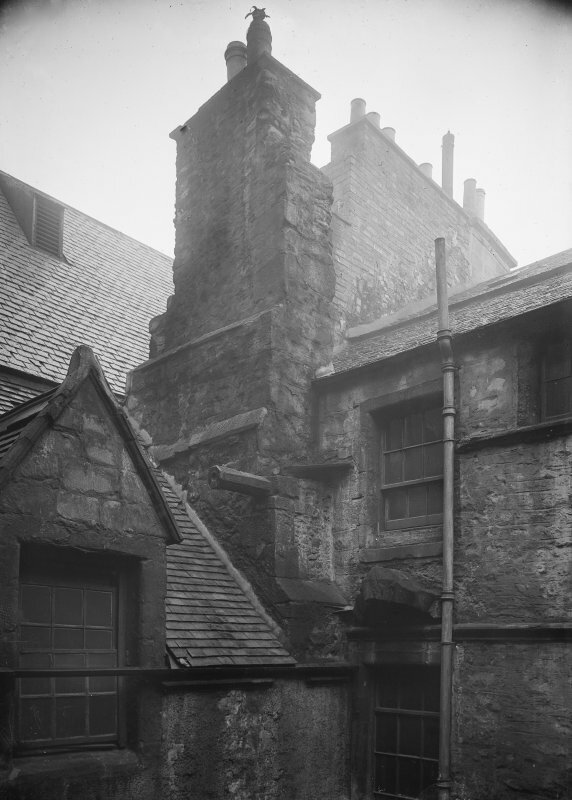 "Ramsay Traquair, 1896"
General view of upper storeys and roof of Bailie McMorran's House. 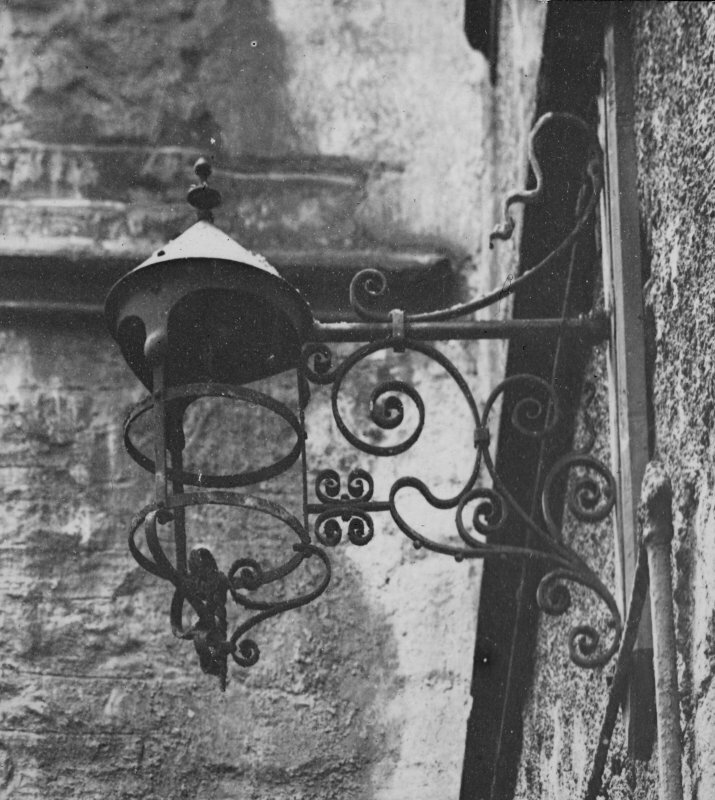 16th-century. 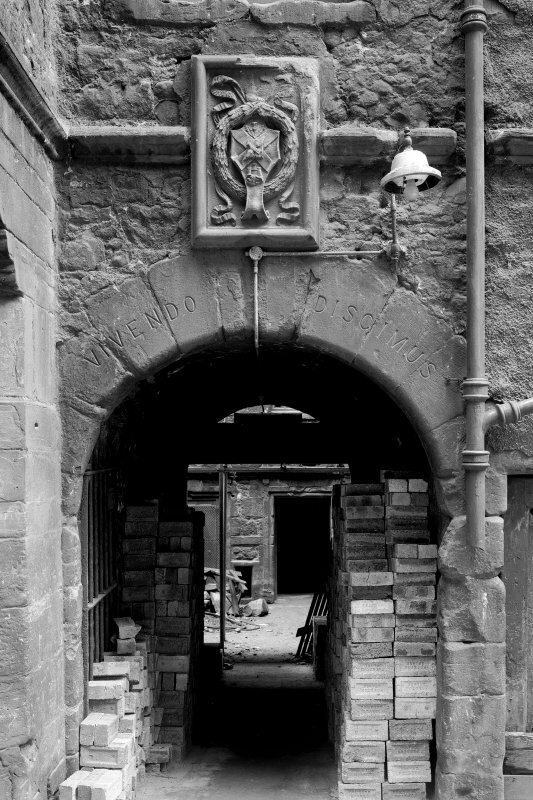 Mainly 3-storey, rubble-built and harled with sculptured Scots Renaissance detail and string courses. 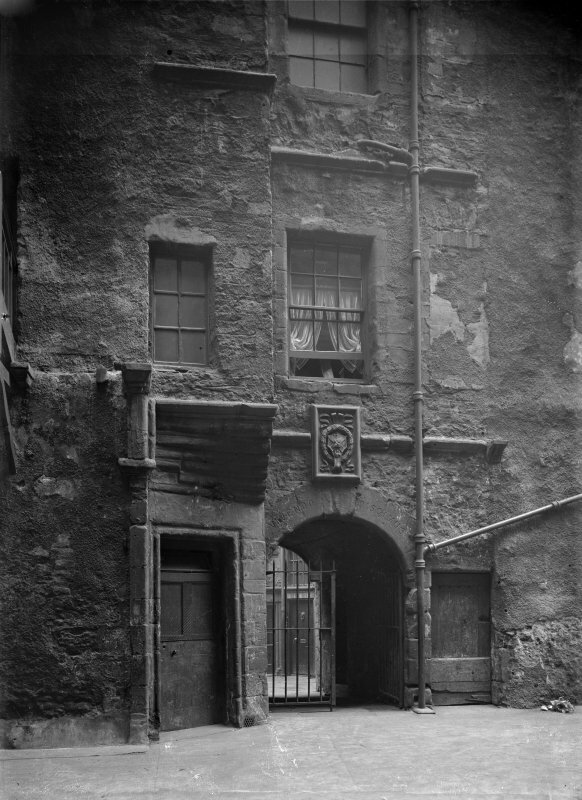 Frontage to south George Smith c. 1840 resulting from the formation of Victoria Terrace. 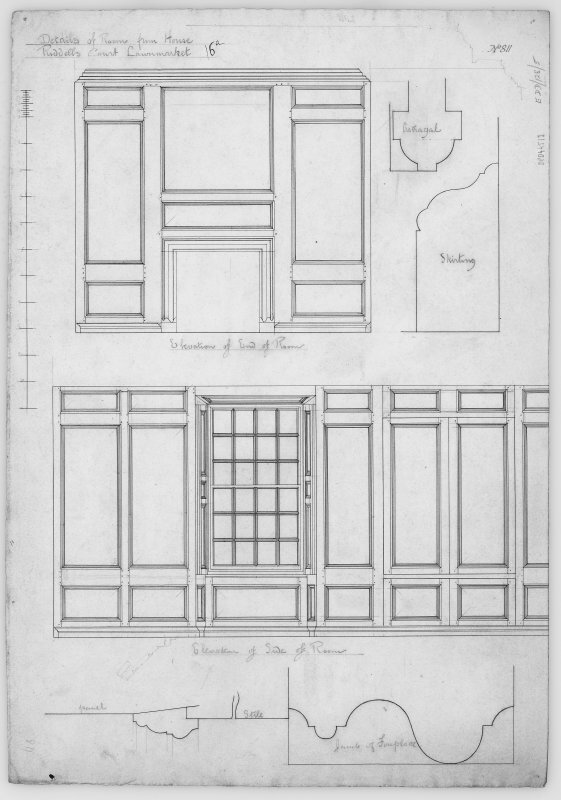 Fine 17th and 18th century interior work. Renovated S Henbest Capper 1893 and restored 1964, J Wilson Paterson. OWNER: Edinburgh Corporation Education Department? 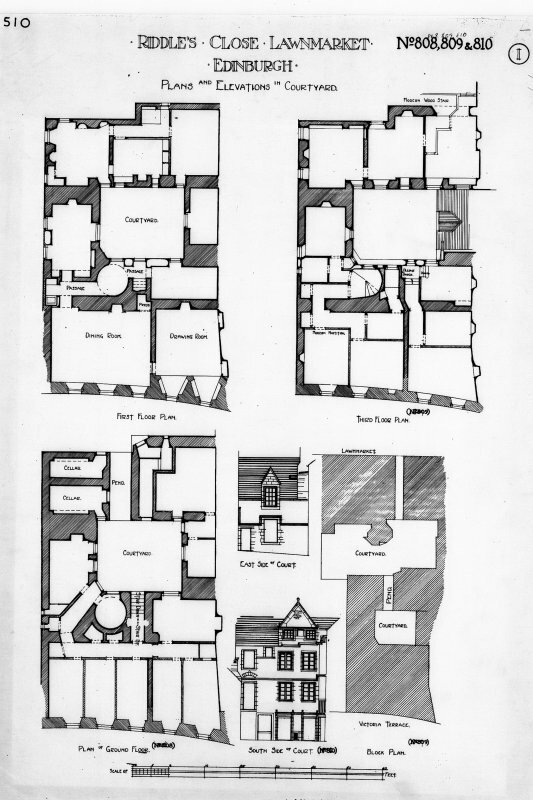 Non-Guardianship Sites Plan Collection, DC23610, 1963. 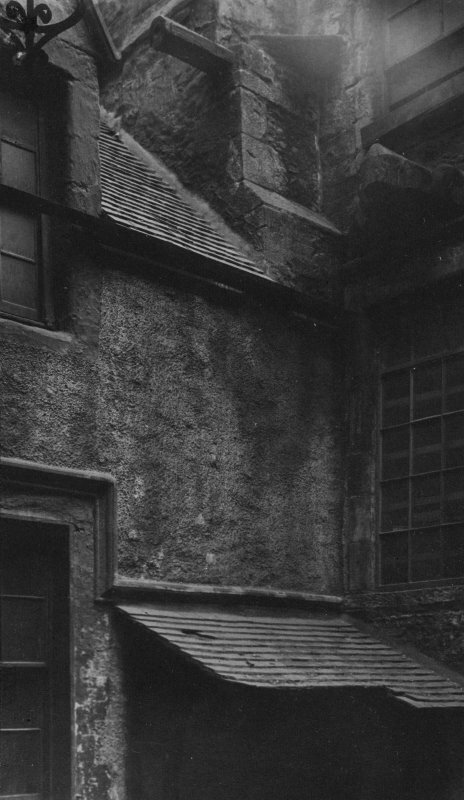 Photographic survey by the Scottish National Buildings Record/Ministry of Work in August 1963. 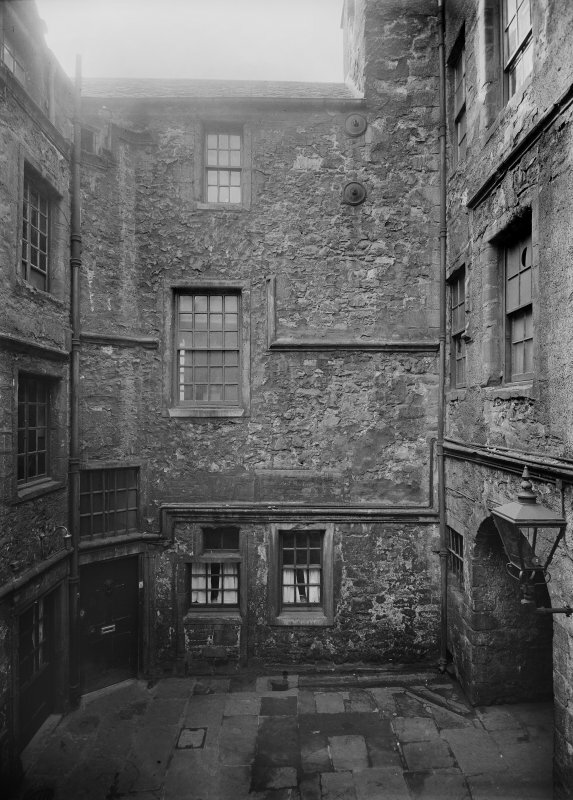 An historical standing building survey was carried out at Riddle's Court, Lawnmarket, Edinburgh between November and December 2012. 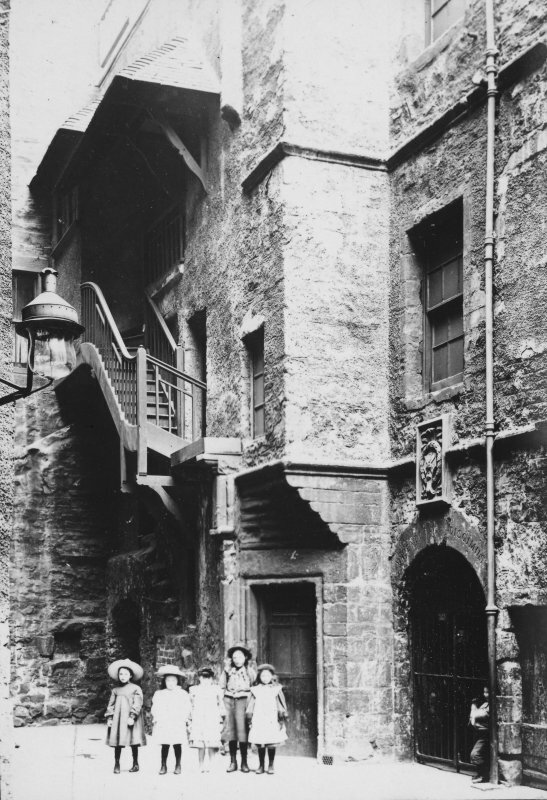 Riddle's Court is a significant A-listed building situated on the Royal Mile in the Old Town of Edinburgh close to Edinburgh Castle. The historical documentary research enhanced the architectural/archaeological investigation to produce a credible broad narrative up to the early eighteenth century. 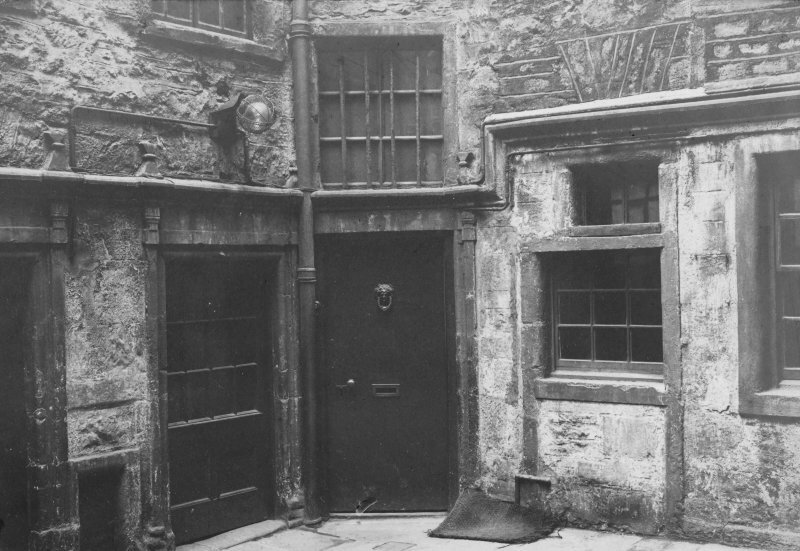 The occupants and critical monetary changes that occurred under each ownership or tenancy between 1584 and 1702 were recorded. Between these years radical alterations within the interior of the complex were carried out to suit the needs of the occupants. 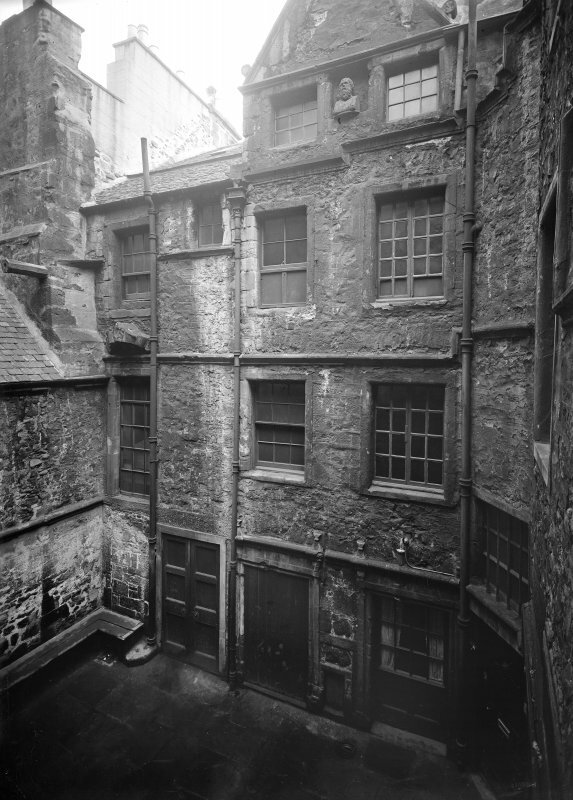 A full photographic survey recorded the current layout of the buildings making up the Riddle's Court building complex. 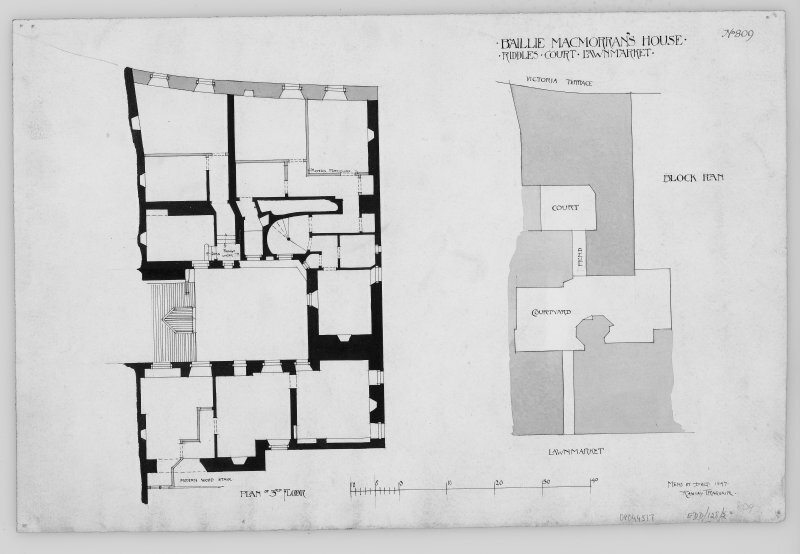 This provides a record of the existing layout of the building and provides a record of the rooms prior to their refurbishment and/or alteration. 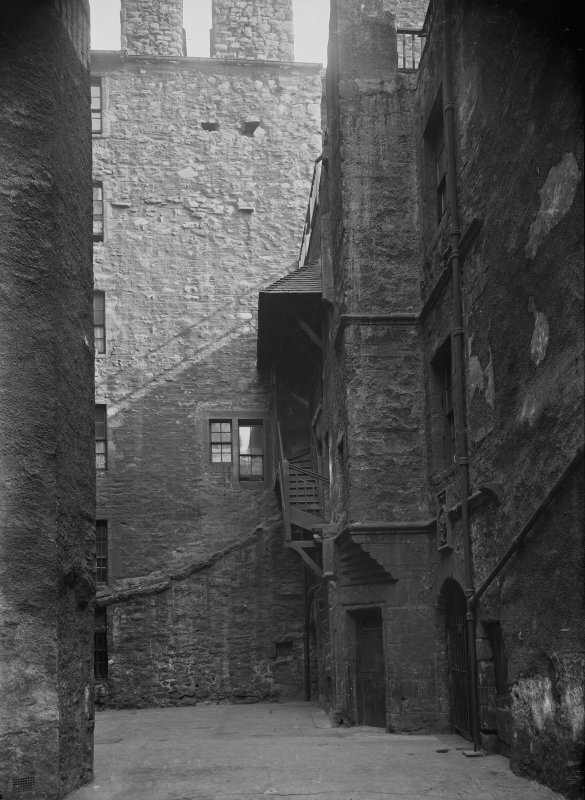 As part of the investigations into Riddle's Court, Ground Penetrating Radar (GPR), undetaken by Sue Ovenden, took place within the inner court and outer courts with the aim to locate cellars, culverts, drains, wall footings and building remains. 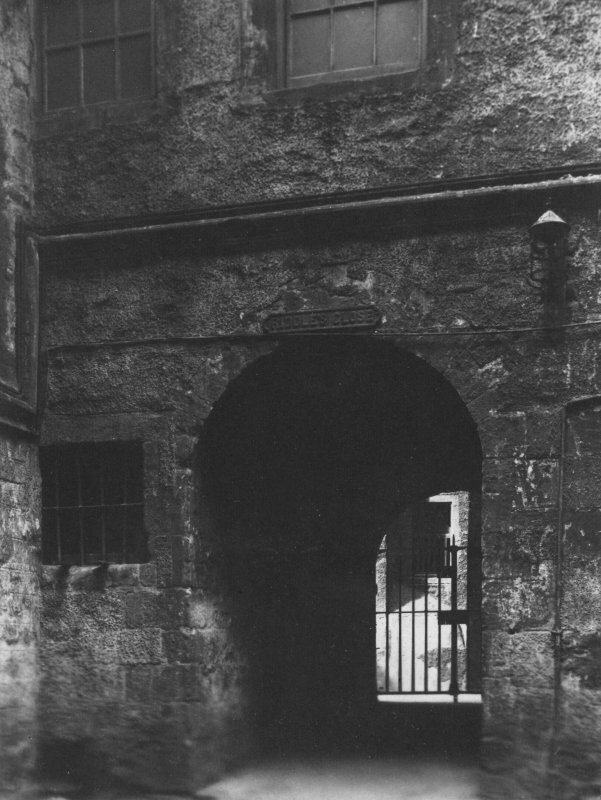 A cellar is known to have had in its entrance hatch on the north-eastern side of the Inner Court, but only patchy anomalies were found in this area, suggesting that it had been mostly in-filled. On the western side of the Outer Court a variety of confused anomalies suggest that only shallow remains are present from the buildings known to have previously occupied this part of the site. 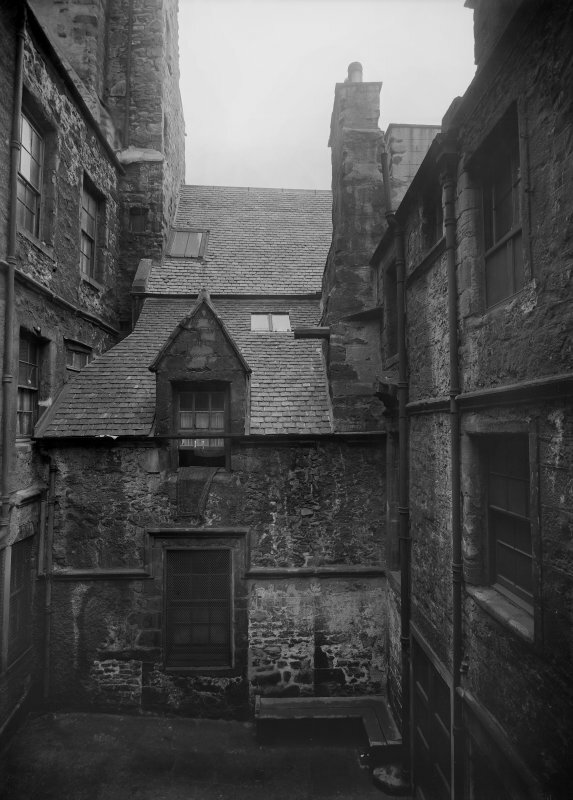 Further building recording work and watching briefs took place at Riddles Court between 2015 and 2016. The principal features recorded included seven hitherto unrecorded fireplaces dating from the late 16th century to the late 19th century. 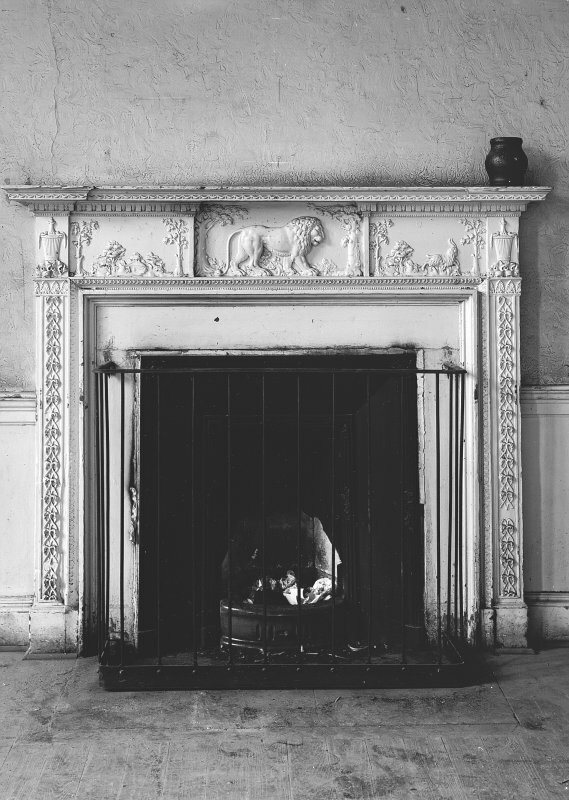 The earliest and largest fireplace was found on the ground floor of the West Block. 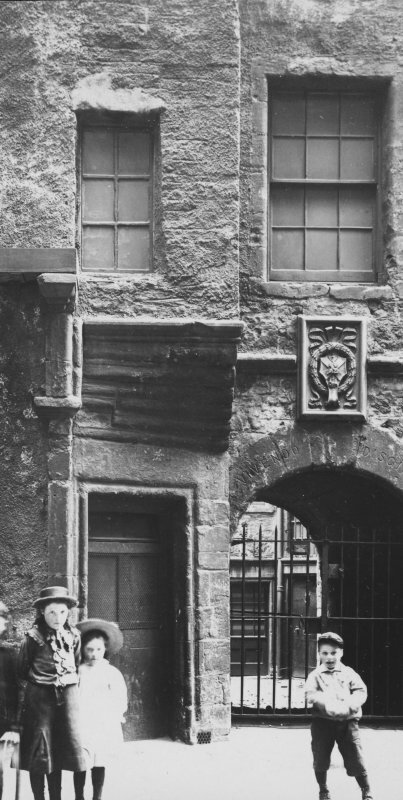 This was an arched fireplace with a later fireplace and coal cupboard inserted within it. Once these later features were removed a bread oven and salt press was found within the interior of the fireplace. 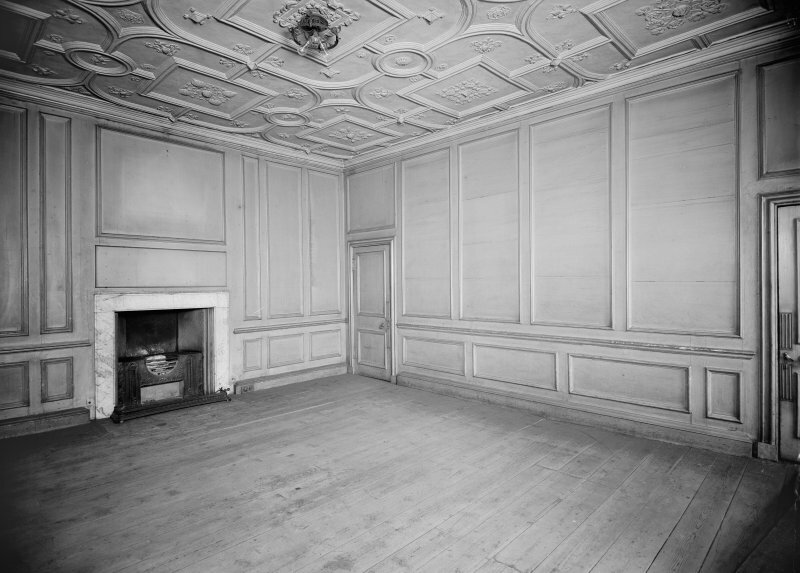 Investigative work within the North Block revealed the presence of two painted beam and board ceilings. A first floor ceiling had a series of painted beams and all but one painted board survived. 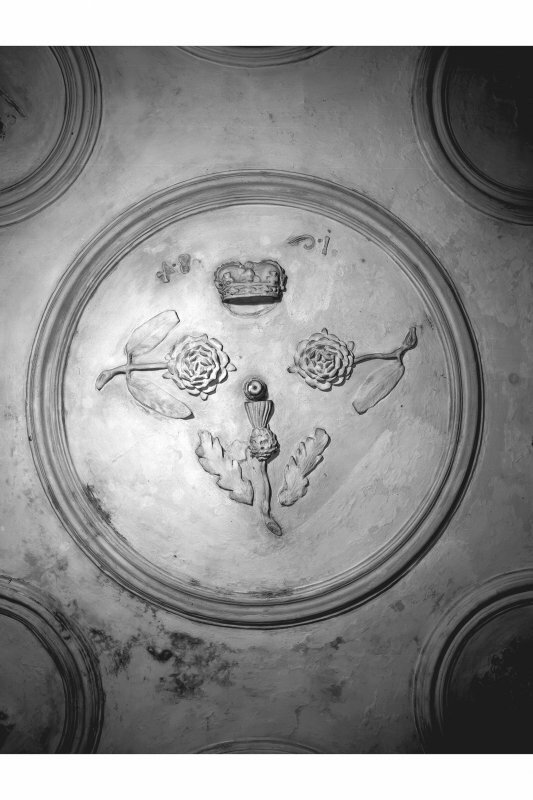 This appears to have similar artwork with a ceremonial painted ceiling installed to commemorate a royal visit by the Duke of Holstein brother in law of James V1 of Scotland. 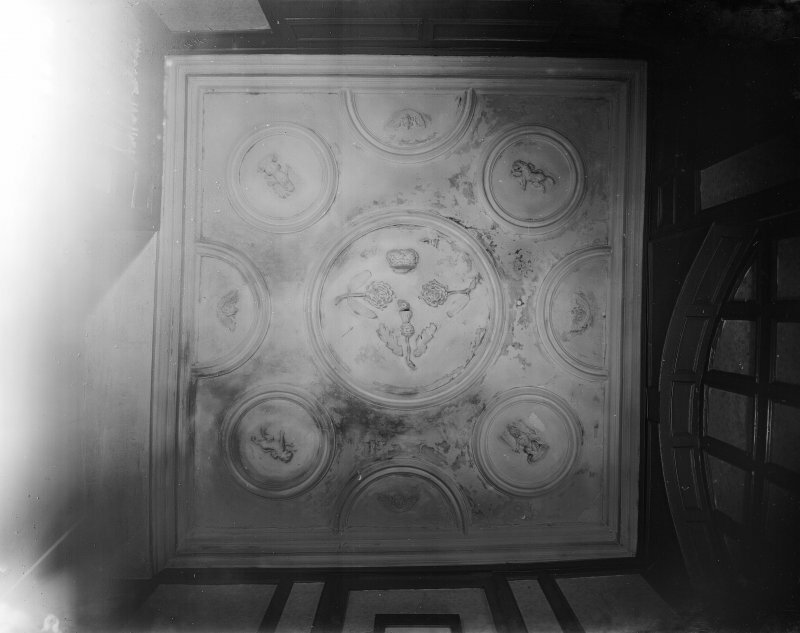 A second painted ceiling was found to have survived in a better condition on the second floor. 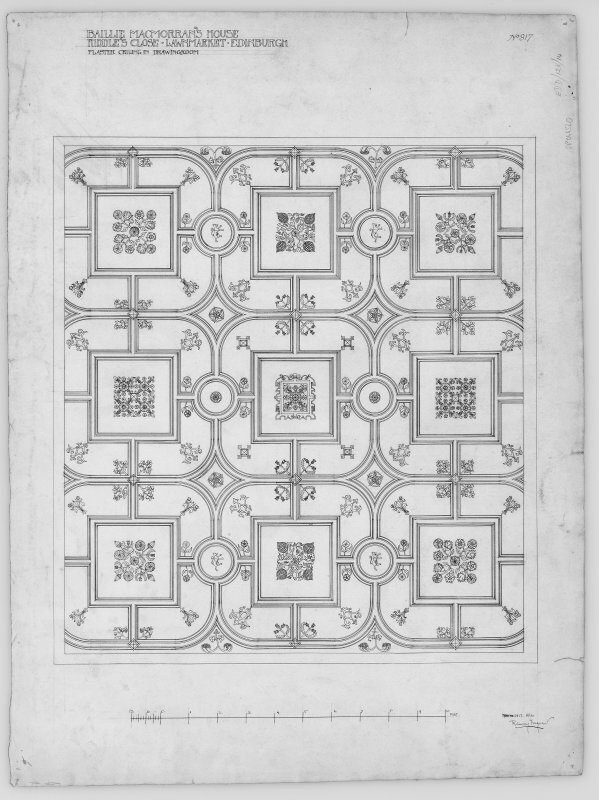 The artwork was a mixture of foliate swirls and patterns within a series of parallel borders. A third ceiling was found at the roof level when the existing ceiling was removed. This revealed an original third floor. The pine planks were lifted to reveal tempra artwork below. The artwork was seen to be the same as that on the painted ceiling at second floor level suggesting that they were by the same artist. Floor reduction work within the ground floor of the North Block revealed historic cobble flooring above various earlier beaten floor layers. The results have allowed the revision of the earlier phase development model. 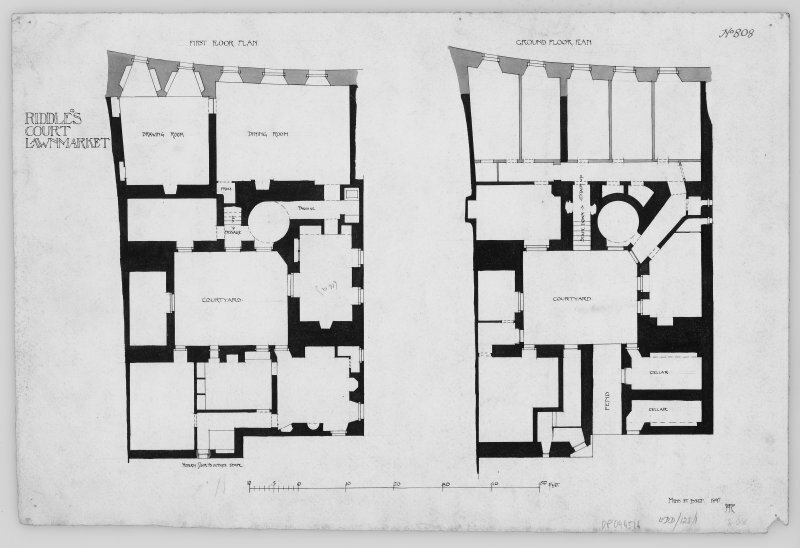 During phase 1 the building was assessed for dendrochronological dating which then took place during phase 2. One timber was found to have definitely been felled in spring 1586 AD which ties in with the date stone of 1587 AD in the West Block. The North Block was constructed first, and the tree-ring correlations show that there was only three years or so between the construction of the two buildings. Information from Michael Cressey (CFA Archaeology Ltd) November 2017.